5 Star Cases used the 2013 PLASA exhibition at ExCeL London to re-launch its popular ‘Speed Challenge’ motor racing simulation game … crowning Carl Sheehan, deputy manager of event technology specialist PSAV as the 2013 5 Star Speed Challenge Champion. 5 Star created a completely new bespoke simulator for this year’s Speed Challenge, built using 5 Star’s legendary Super Tour specification product, complete with several special features and running Sony’s PlayStation 3 Codemaster F1 2012 racing game in full HD. The 5 Star Speed Challenge was first seen at PLASA 2006. This year it had an additional resonance as 5 Star has been one of the most enthusiastic of a number of industry supporters of British Touring Car Championship (BTCC) racing’s rising star, Jack Goff, throughout the 2013 season. The 5 Star Speed Challenge ran on all four days of the exhibition, and was open to all bona-fide trade visitors to the show – on production of a business card. The challengers logging the quickest circuit time during each hour of the show won a fabulous limited edition 5 Star briefcase with stylish contemporary union jack design on the front. Carl was the very lucky person gaining the overall quickest time over all four days of Speed Challenge, clocking an impressive sub 1 minute 35 second lap to clinch the title. 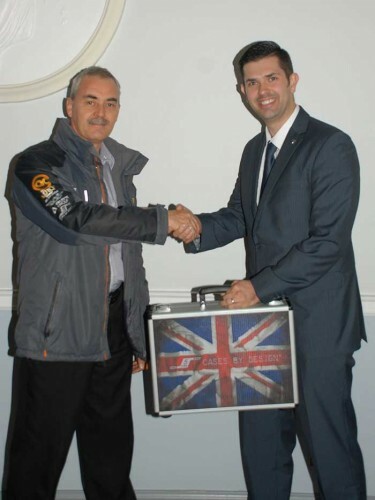 He was presented with his briefcase by 5 Star’s MD Keith Sykes and in addition to that, has won a Track Day with Jack Goff – the industry’s very own motor sport champion. Carl – himself a keen motorsport fan - is based at the landmark Dorchester Hotel in Park Lane, London, along with four colleagues who look after the high profile property’s AV requirements. PSAV has a 75-year track record of setting standards for event technology services within the hotel, resort and conference centre industry, offering expertise and imagination for all types of events, from intimate gatherings to large conventions. Keith Sykes comments: "We have always found it a good policy to mix business and fun at trade shows, but this year’s Speed Challenge surpassed all previous records on both fronts, attracting a massive amount of people to the stand. We had a brilliant PLASA all round, and are looking forward to a very busy last quarter of the year!" The 5 Star Speed Challenge booth helped showcase many of the specialist and custom case design features that are available from 5 Star, including access flaps, angled panels, complex internal supports, power inlet dishes and connectors, etc. It was finished in a two-tone grey and black laminate exterior. The new speed challenge booth concept included a 50" LED screen, fitted to a special motorised TV lift enabling the screen to be raised 750 mm to the viewing height position, and this assisted in keeping the overall case height to a minimum when lowered. It was installed with a Logitech G27 racing steering wheel and pedal system and custom surround sound audio, together with specially developed software by 5 Star, that organised the driver’s timings incrementally and printed out their lap times. The simulator was busy constantly throughout PLASA, and word also soon got around, prompting more people to flock to the booth to check it out. The 5 Star Group recently entered the world of motorsport sponsorship by supporting Jack Goff during 2013 – his first season in the BTTC category – which ended on a massive high with a second place on the podium following a thrilling drive at Brands Hatch in the final race of the year last week. 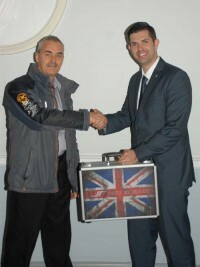 In picture: Keith Sykes with winner Carl Sheehan from PSAV.